Think Outside the Box Like MMD Medical and Win! Don’t Miss Your Chance to Win T-Wolves or Wild Tickets! Often in manufacturing we’re faced with seemingly impossible challenges to cut cost and meet aggressive delivery commitments while maintaining optimal quality and performance. 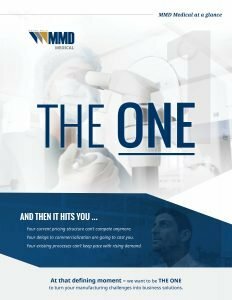 At MMD Medical, we use a combination of proven expertise and creativity to uncover the unique solutions required to achieve our customers’ specific, demanding business goals. To help our customers launch innovative, life-saving products, our team has become savvy at delivering never-been-done-before solutions that help our customers gain significant market share. Now, we’re looking to see who else has what it takes. Here’s your chance to see if you can deliver an engineering solution in three minutes or less! When connecting the dots isn’t easy, it’s time to think outside the box. Try it yourself for a chance to win. WIN TWO TICKETS ON THE FLOOR AT A T-WOLVES GAME OR ON THE GLASS AT A WILD GAME! Questions regarding our wide range of services and custom solutions?